The swamp rabbit population at the Houston Arboretum is in an upswing! If you have been to the Arboretum in the last few months you might have noticed all the cute rabbits hopping around! While it is not unusual at all for native rabbits to be found here, it is out of the norm to see them as easily as we do now. 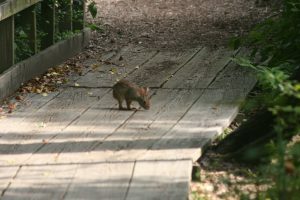 Typically rabbits are seen scarcely, and hop away when humans are near. Recently, however, rabbits appear to be so ubiquitous that they can be seen bounding across trails in front of visitors, darting through the parking lot, and chewing on morsels in the meadow. Their surging populations are not causing a problem yet (see below), but they could suggest different things about the state of our landscape. Fun fact: the rabbits seen here are mostly swamp rabbits and seldom cottontails. Second fun fact: swamp rabbits are great swimmers! Sometimes you can see them making their way across the pond at the Arboretum. Our naturalists believe that the abundance of rabbits could be an indicator that our grounds are recovering from the devastating drought we had in 2011. You might remember that following hurricane Ike the climate patterns changed for the next year leaving us with little rain to support our ecosystem. This drought was especially hard on the Arboretum’s trees – we lost nearly 50% of our tree canopy!! The substantial loss of trees and other flora altered the mini-ecosystem here at the Arboretum. With fewer trees creating shade down below, the forest floor was flooded with sunlight. This sunlight was welcomed by a plethora of opportunistic ground cover plants who shot up to take advantage of the rays. The increase in soft leafy vegetation covering the ground has been able to sustain much higher rabbit populations than the shady forest could. Third fun fact: while the loss of so many trees was indeed very sad, it gave us the the incentive to create our Master Plan which aims to restore our grounds and create a more resilient landscape. Nature does provide us with checks and balances within its hierarchy of organisms to keep various populations at bay. For instance, our wild coyotes (yes we have them!) are a natural rabbit predator. Unlike rabbits who have several large litters of adorable baby bunnies per year, coyotes have maybe one or two cubs annually. Their populations might not have had a chance to catch up to that of the booming bunnies. There still could be other reasons why our rabbit populations are proliferating. Other predators like owls (and feral dogs) could be declining or unable to keep up. While seeing the bunnies chew on seeds that have fallen from the bird feeder outside our office window is endearing, the rabbits could potentially cause issues with newly planted natives. Much like the deer that eat anything in the rest of the country, rabbits eat anything here. If their populations continue to grow, we might have to find a way to keep them from eating all of our freshly sown plants, vines, and flowers! What do you think? Do you have an increase in rabbits where you work or live? Please feel free to share them in the comments below! You can also come check out the rabbits for yourself at the Arboretum! While sighting are not guaranteed – I would recommend coming in the morning or late afternoon to see them. *The mini-ecosystem change we had here at the Arboretum initiated our Master Plan which is our extensive project to restore our habitats and expand our educational programming. I saw a very daring bunny cross the road on my way into the Arboretum on Tuesday morning! 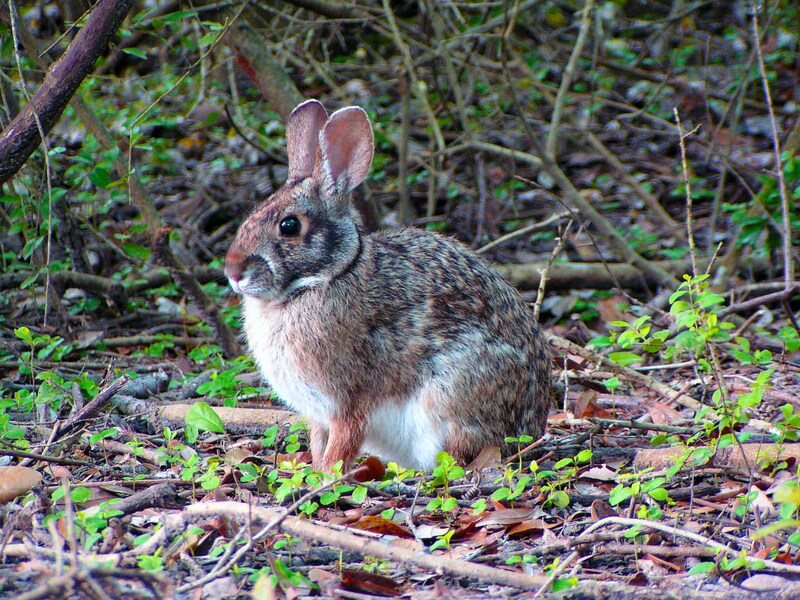 Along Bray’s Bayou near Buffalo Speedway in Braeswood we have had a significant increase in rabbits over the last two years. At first we attributed it to the habitat enhancement of our flourishing native plant prairie garden on the south bank of the bayou. But now the rabbits have crossed South Braeswood Blvd. and are prolific in Knollwood and Linkwood as well. Also this year we have had a dramatic increase in the crow population. The crows seem to be pushing out the grackles. There are so many crows that it sometimes feels like we are in the Alfred Hitchcock movie, The Birds. My sister lives in Westpark @ Belt way 8 area; in that area there aare lots of rabbits going into the Seniors apartments parking lot! we can see them eating of the plants in the complex garden. I also picked up a big turtle that was traying to cross the street, I put it back into the little green area left in there. i don’t know if I did right, but, at that time I believed it was the best option. can those little animals be relocated? I believe they are about to lose their habitat!!! Great question! You did the right thing by moving the turtle, it is dangerous for them in the street! Sometimes you can help the turtles out by moving them in the direction that they were attempting to go. If the turtle was crossing the street, try scoping out the area and seeing if there are any natural areas he might be travelling towards. It is possible if they are taken back in the direction they came from, they might just walk back out again. Turtles sometimes seek out concrete to warm themselves not knowing its dangers. As for the rabbits, when their populations reach certain levels, the young will try and leave the area in search of a new home. Unfortunately there is no relocation program for the little animals. It helps for drivers to be aware of the rabbits so they are not hit. Maybe you could consider a “Watch for Rabbits” sign or something of that nature?